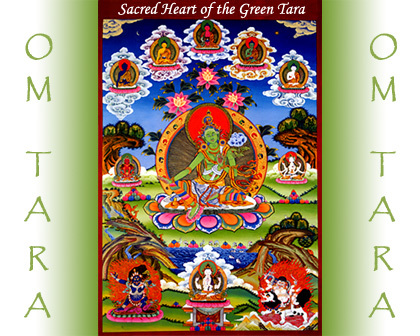 As the Mother of all Healing, the Green Tara shelters All beings in Her Loving embrace and is the Spiritual Bestower of all Health, Upliftment and Well-Being. The loving embrace of the Goddess Tara radiates outwardly as Kindness, Compassion and Healing for All from worldly or spiritual concerns. May the powerful blessings of Peace, Health, Wealth and Love be Yours. May the prayers of all Bodhisattvas and the blessings of all Spiritual Beings enter your heart and hold in their hands all your precious needs. May all your needs be exactly what you intend and may your intentions move in you, from you and return to you with the strength and the power of Living your Life as Divinity Now! So be it! May the free set others free."